It can be seen that many a times 3 phase transmission lines are working with more than one circuit in parallel. There is negligible mutual inductance between the circuits if they are widely separated. In this case the inductive reactance of the single circuit is half of the individual circuits considered alone. But in actual case the method of GMD is used to find inductance of each phase. This is done by considering the different conductors which are in parallel as strands of one composite conductor. If there are more than one circuit in parallel then it is desired that the equivalent circuit should have low inductance. This can be achieved with low value of Dm and high value of Ds. In order to achieve this individual conductors are separated as widely as possible and the distance between the phases is kept small. 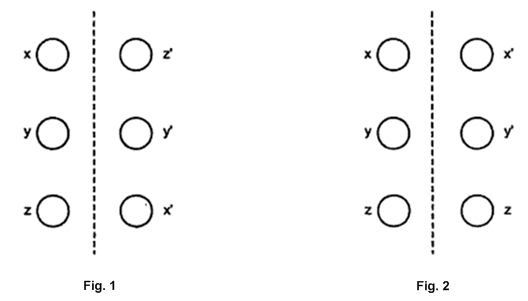 Thus in case of double circuit, conductors are arranged as shown in the Fig. 1. and not as shown in the Fig. 2. It can be seen that low value of the inductance is obtained with the arrangement of conductors shown in the Fig. 1.